Campaigners in north London have claimed victory after plans for a new Tesco store were turned down. 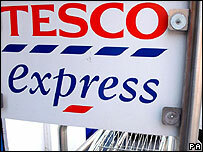 Barnet Council rejected the original planning application for a Tesco Express on Ballards Lane in Finchley. The decision was upheld by government planning inspectors who said such a store could "harm the viability" of nearby town centres. Barnet councillor Brian Coleman said small shopping centres need protecting from large convenience stores. "Tesco has a legitimate place but they can't take over every single suburban shopping parade in London," he said. Tesco was accused of using Trojan horse tactics - using the cover of the premises' leaseholder, a carpet shop, to apply for a change to the planning conditions. The store was applying through Carpets 4 Less to lift a condition which stated the premises had to remain a carpet showroom/warehouse. Barnet Council rejected the application in December 2005 to convert the carpet warehouse into a convenience store. A Tesco spokesman said: "This is a local decision which does not reflect a general trend as we usually find that a variety of other shops including butchers, bakers, greengrocers and newsagents can trade well alongside our own. "They can benefit too, from the extra customers we bring to the high street." The government inspector agreed on appeal that the Tesco application did not demonstrate a need for an additional convenience store.